Addison, TX - (March 3, 2011) Industrial Networking Solutions (INS), the sales leader in industrial networking products, services and training, today was awarded Moxa's Distributor of the Year Award for the United States Central Region. 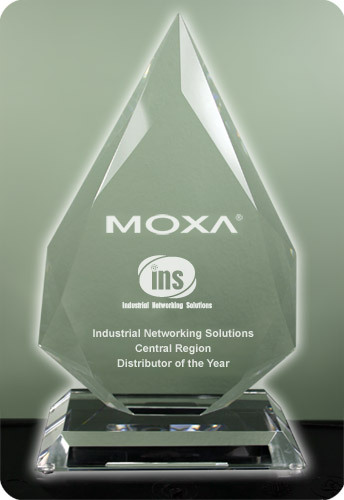 When asked about the award, Mike Finley, President of Industrial Networking Solutions stated, "While 2010 was our first full-year of offering Moxa products, this award along with the consumers demand for industrial IT product variety validates the addition of Moxa to our product offering." "Moxa offers a strong product portfolio, leading edge products and a tremendous marketing campaign keeping INS on the forefront of the industrial IT market." Moxa manufactures device networking products for industrial automation. Information about all Moxa products, which include industrial embedded computers, industrial Ethernet switches, serial device servers, multiport serial cards, embedded device servers, and remote I/O, is available on Moxa's corporate website at www.moxa.com.